The first thing that clients tell me after starting our Fit 1 Bootcamp exercise program is how much better they feel. Call or email Fit 1 Bootcamp! The best bootcamp in Etobicoke will help you get started on a program that will take the guesswork out of fitness and to set your results on fire. Combine the pecans, 1/4 teaspoon of the vanilla bean, sea salt and 3/4 cup of the dates in a food processor. Press half of the mixture into the bottom of a pie pan, set aside. 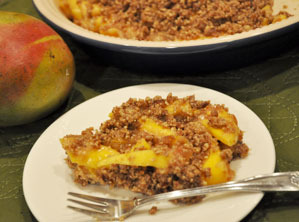 Arranged the mangoes over the crust, then sprinkle with the remaining crust. Share this newsletter with your friends. If they need some guidance point them to the best bootcamp in Etobicoke. Check out the Best Bootcamp in Etobicoke, Fit 1 Bootcamp’s face book page!